Water-proof, split-proof, tear-proof, adventure-proof. Corfu Tour & Trail Super-Durable Map is simply the toughest, most accurate, easy to read, easy to use map of the island you can buy at any price. David & Ros Brawn surveyed this beautiful island in 2016 carrying out their ‘gps ground survey’ pinpointing all the details needed to produce the definitive map of Corfu. In 2019 we have updated/corrected our Corfu place names to correct some errors in our 1st edition, along with a few minor updates. If you already own our Corfu 1st edition we suggest you continue to use it as these updates are a minor item. Corfu Tour & Trail Super-Durable Map is the most detailed, accurate, toughest, large scale map of the island that you can buy. 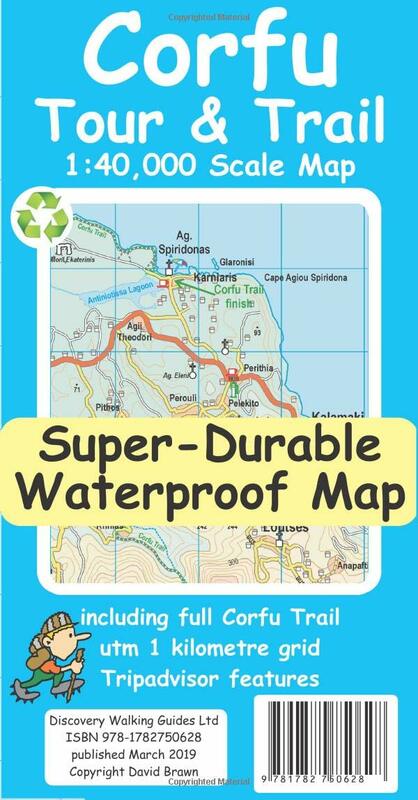 Super-Durable Maps now come with a 2 year adventurous use wear and tear guarantee, see Discovery Walking Guides website for details. Corfu North is on the facing sheet of the map with Corfu South on the reverse side, including a generous overlap between the two sides. You get the most detailed map of Corfu that is produced including our 'Tour & Trail' level of detail ranging from major roads to secondary roads to minor roads to streets and narrow country roads, plus dirt roads and walking trails. We have a new method of highlighting the full Corfu Trail, including its options, with the trails, tracks, lanes and roads making up the Corfu Trail being outlined in green. This makes it easier to identify the Corfu Trail on the map and easier to find it on the ground. Altitude background colouring is designed to clearly show the altitude range when traveling across the island by car or on foot. 100 metre and 20 metre contours are clearly shown on the map along with a large number of individual height points. New for our Corfu Tour & Trail Super-Durable Map we have introduced special Place-Name Plaques for Tripadvisor's most popular destinations making them easy to find. Super-Durable editions are printed with 100% oxygenation inks on Polyart by the UK's leading map printer.This produces a Super-Durable Map that feels like silk but will stand up to the roughest treatment of outdoor adventuring and yet fold up like new at the end of your adventure. Quite simply Corfu Tour & Trail Super-Durable Map is the most detailed, accurate, toughest, large scale Corfu map that you can buy. Super-Durable maps are 100% recyclable.